As an advertisement for the strength of US-Singapore ties, the past few days are perhaps without parallel. 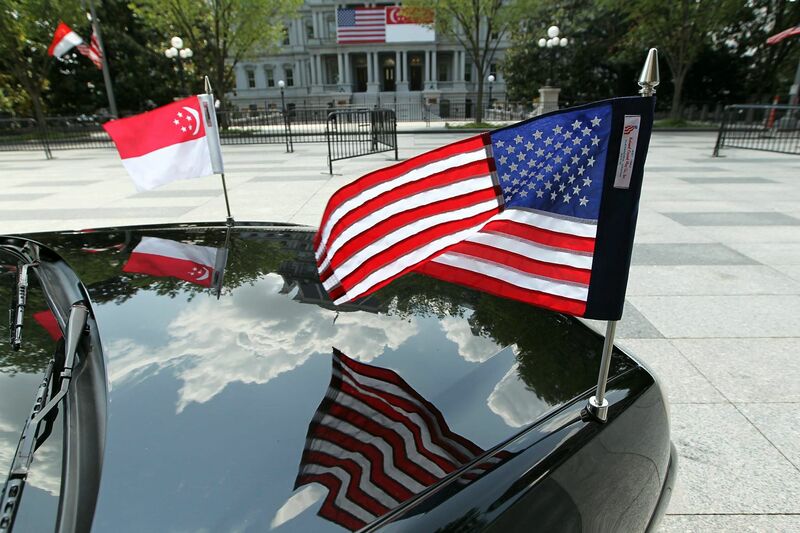 The United States rolled out the red carpet - literally and metaphorically - for Prime Minister Lee Hsien Loong and the Singapore delegation as both countries celebrated 50 years of ties in spectacular fashion. Streets and buildings around the White House were decked out with Singapore and American flags, military ceremonial guards in bright uniforms welcomed PM Lee everywhere from the White House to the Pentagon and the Singapore national anthem rang out in the US capital on at least three occasions. After Obama, what next for Singapore-US ties? All of it culminated in a glitzy black-tie White House dinner that was attended by the political top brass, as well as some familiar faces from other fields such as actors Matthew Rhys and Kerri Russell. 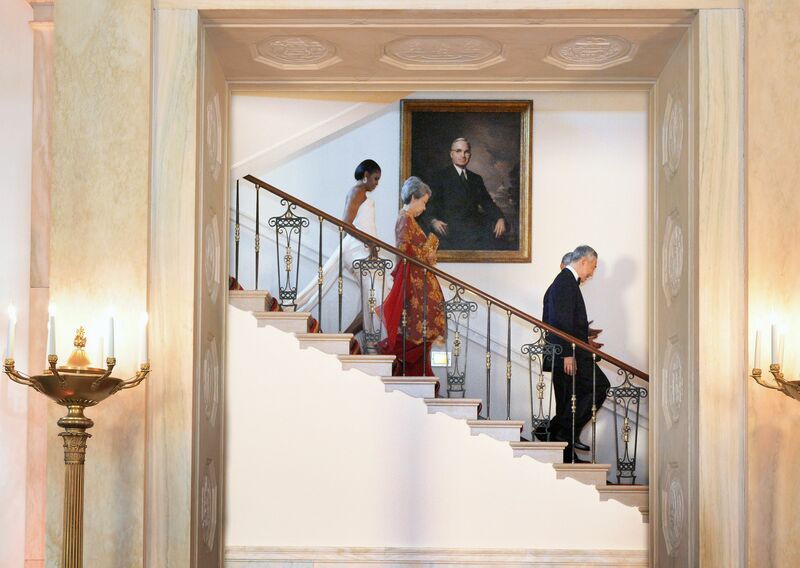 Throughout, the strong personal rapport between Mr Lee and President Barack Obama shone through. One standout moment came midway through a grand arrival ceremony. After inspecting the guard of honour, both leaders took a little detour to a roped-off area full of people waving little Singapore and American flags. They mingled with the crowd, shaking hands and posing for selfies before seeming to realise belatedly that they had an arrival ceremony to get back to. For all the happy scenes and declarations of friendship, a dark cloud loomed: What happens when Mr Obama - a self-avowed Pacific President - is no longer in office? With just three months left before Americans pick his successor, was what the world witnessed this week the commemoration of a milestone or some sort of final hurrah? It is undeniable that US engagement with Asia has grown under the presidency of Mr Obama. It was during his tenure that the Asia rebalance became US policy and he has made a point of visiting the region nearly every single year since he occupied the Oval Office. Even Mr Lee said he noted Mr Obama's focus on Asia back in 2007, before the then senator was deemed a likely White House occupant. "You were in the midst of a hard-fought presidential campaign, and not yet the front runner for the Democratic nomination," he said during his toast at Tuesday's state dinner. "Your years growing up in Indonesia gave you direct experience of South-east Asia's cultures and challenges. As President, your personal leadership and decision to rebalance to Asia has won America new friends and strengthened old partnerships, including with Singapore." Mr Obama is the first president to visit Myanmar, the first to visit the Peace Memorial in Hiroshima and the first to host a meeting for Asean leaders on US soil. Yet, his success does not necessarily ensure his country's future engagement with Singapore and the region. If Asia forms a core part of Mr Obama's legacy, then it is likely that his successor will seek achievements in other realms. While it won't be abandoned outright, it seems unlikely that the next president would match his focus on the region. As founding prime minister Lee Kuan Yew lamented in a 1984 speech in Parliament, new US presidents can reset the good progress made. He said: "America's allies shudder each time a new president takes office and starts off on a new initiative. Helmut Schmidt, the former German Chancellor, once told me, what a burden it was that just when they had educated President (Jimmy) Carter, they got to start all over again educating President (Ronald) Reagan on the facts of international politics and international finance." Especially worrying this year is the current anti-globalisation mood gripping US voters. Both presidential candidates, but more so Mr Donald Trump than Mrs Hillary Clinton, have appeared to recoil from the openness of America. Adding to that is the uncertainty over how much of the US' Asia rebalance policy is institutionalised. There is no known official document that specifically outlines the Asia rebalance. And there is nothing to compel the next president to attend summits or ensure that the first Asean leaders' summit in the US will not be the last. Then there is the unanswered question of the Trans-Pacific Partnership free trade pact. Should it be ratified by the US Congress, it becomes the lynchpin of the rebalance. But if it fails, it could wreck all the credibility Mr Obama has sought to build in the region. The source of hope in all of this, as both Mr Lee and Mr Obama have pointed out, is that the relationship has weathered storms before. Taken over the 50-year timeframe, US-Singapore ties have grown deeper and broader through nine different US presidents. There is now enough substance - be it in terms of the economy, defence or people-to-people ties - to suggest that the ties can survive changes at the top. Said associate professor of political science Bilveer Singh at the National University of Singapore: "I think Obama helped to cement a relationship that has been built up since 1966. This relationship is not made by one leader but by a series of leaders and administrations brought together by common and convergent political, economic and strategic interests. This is likely to outlast Obama and Lee Hsien Loong." Similarly, Singapore Institute of International Affairs chairman Simon Tay said the relationship goes beyond who is currently occupying the Oval Office:"For the relationship to endure, it is not just the president - though presidents are important - it is the whole establishment of America." What the two sides have today is a far cry from what it was 50 years ago, when so much of the attention the US granted Singapore was anchored on Mr Lee Kuan Yew's value as a strategic thinker on Asia. Singapore leaders now have more regular access to their US counterparts, and the US considers Singapore a key part of much of what it wants to do in Asia. And that, ultimately, seems like the big takeaway from the ceremonies of the past few days. While the pomp and splendour grab all the attention, it is the more mundane details of the visit - the memorandums of understanding, the platforms for collaboration, the discussions about regional issues - that provide the clearest indication of the resilience of ties. While it is difficult to predict what will happen on Nov 8 or even another 50 years down the road, this week's events are a reminder of how strong a foundation the US and Singapore have to build on.